When we think about the places we should see in our lifetime, those that feature breathtaking natural wonders are definitely near the top of the list. 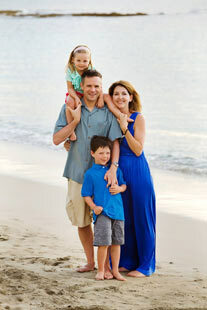 They give us a much broader sense of our space in the world, which, as I’ve mentioned many times, is really important to us to show our children. They also often invoke emotion unlike we have ever experienced before. I remember the first time I saw Petra, I had tears in my eyes. One thing I regret is that we have not taken our kids to see many national parks and I hope to rectify that in the next year. Top of our list? Amazing waterfalls! Let’s look at some of the most amazing waterfalls in the world that will leave you awash with wonder. 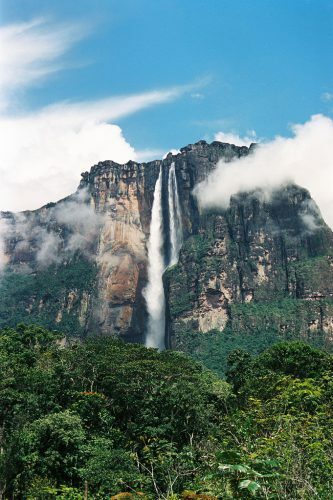 This spellbinding Angel Falls is the highest waterfall in the world. It is situated in the Guayana highlands in the UNESCO protected Canaima National Park in Venezuela. The water powerfully courses down 979 metres, which is a staggering 3,212 feet. The water comes from the Churum river which is on the periphery of the “Auyantepuy” Table Mountain. This spectacular waterfall gets its name from James Crawford Angel. He was an adventure pilot, who first spotted this natural wonder back in 1933. The Falls lay an isolated and remote location which takes a pretty demanding hike and boat ride to reach. But its beauty is incomparable, and it’s definitely worth the taxing journey. In Angel Falls you also have a high chance of seeing jaguar, cougar, eagles and hummingbirds. You can also enjoy kayaking, canoeing and natural water swimming. It’s almost like a safari, as well as a sightseeing adventure. The most famous of all the waterfalls in the world, Niagara Falls, is a staggering sight to behold. The Falls are located on the border of the USA and Canada. We have no excuse NOT to visit Niagara Falls now because we have friends who just moved to Niagra on the Lake, on the Canadian side. 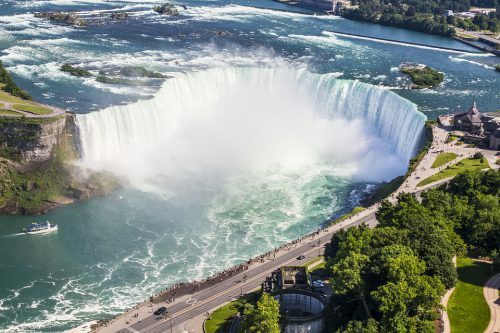 The Horseshoe Falls are owned by Canada and the American Falls owned by the USA. The Horseshoe Falls feature a drop of 173 feet, and there are myriad ways which you can enjoy this commanding surge of fresh water. You can take a cruise to the foot of the Falls or go on an epic journey behind the Falls by descending 150 feet by elevator to two outdoor observation decks. Both trips require a waterproof poncho, and you’ll definitely be getting wet! To give you an idea of the power of the Falls, over 2,800 cubic metres of water thrash over the top every second at speeds up to 65 kilometres per hour. Seeing Niagara Falls is definitely one to put on the bucket list. And it is a very accessible waterfall to be able to see. Just remember that if you are traveling to Canada, you will need to get an eTA visa before you go, in order to get into the country. This can be obtained at the Official Canada eTA website. 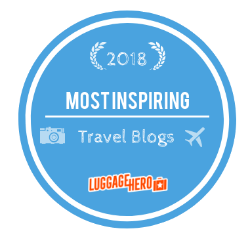 And for more traveling tips check out my Tips section on the blog. This is definitely at the top of our list! Croatia has been a super hot destination for the last few years, and its natural landscape and scenery are truly beautiful. 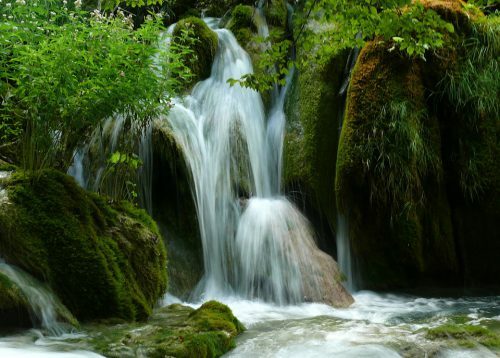 While the Plitvice Falls are not very high, they make up for it in their outstanding beauty. The Falls are situated in the UNESCO World Heritage National Park which is home to sixteen spectacular lakes. The lakes are connected by a series of spellbinding waterfalls in an area that is populated by wild deer, bears and rare birds. The water surrounding these breathtaking Falls goes from cerulean blue to turquoise. And it’s a picture perfect destination to enjoy one of the many natural wonders of the world. Keith and I have both decided that once we start visiting Europe again (we’ve been sticking to Central and South America lately), Croatia and the surrounding area is where it’s at!